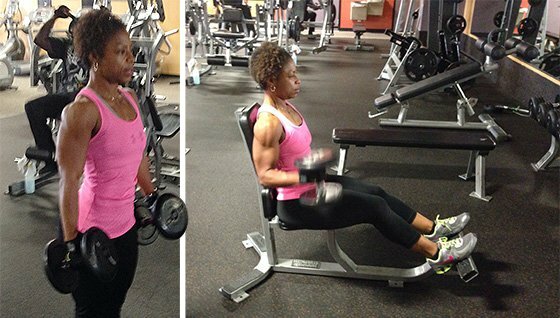 Body Transformation: Paula Moses Set Flame To 22 Percent Body Fat! A life of overindulgence and inactivity made Paula balloon up to 200 pounds with 36 percent body fat. See how she lost 70 pounds and competed at 14 percent body fat! Obesity has been an issue for me since college graduation. After college, I settled into marriage, family life, and started a career. Throughout those years, my weight skyrocketed to 200 pounds. I finally got frustrated with myself for allowing my weight to balloon out of control and decided to change. I couldn&apos;t continue leading a life of overindulgence and minimal physical activity. I didn&apos;t feel good about myself at this weight and feared the onset of genetically predisposed health conditions like hypertension, stroke, diabetes, and heart attacks. Enough was enough! I started my weight loss journey by reducing food portions and joining group fitness. I participated in group fitness classes like cardio kickboxing and spinning. I began to shed pounds and became a certified group fitness instructor. I was pleased with my progress and went from a size 22 to 6. After three years of maintenance, my weight began to creep back up. As my clothes got tighter, I decided to revolt against obesity again. I wasn&apos;t happy with the skinny fat look that I accomplished. In desperation, I reached out to competition coach Jimmy Leach for help. I was willing to try a new approach to kick start my body and redirect my path. My coach redirected my nutritional plan and helped me refocus and change my outlook on life. He taught me to focus on fat loss, not weight loss. With his nutritional support and the addition of a rigorous weight training plan, I was back on track. My body fat plunged and my body began to transform. I gained muscle that I didn&apos;t imagine possible. 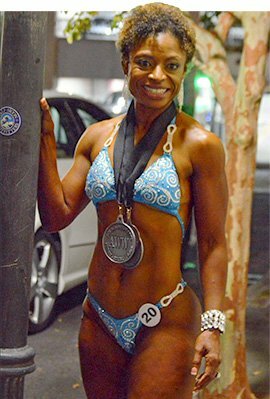 As my body transformed, it brought me closer to fulfilling one of my lifetime dreams to become a figure athlete before age 50. My dream became a reality when I competed in my first figure competition and placed second in my class. I&apos;m more determined now to return to the stage to win. "With a change in mindset, you can improve your overall health and gain many benefits in mind, body, and soul." I want to show others that it&apos;s never too late to make positive changes in your life and pursue your dreams. With a change in mindset, you can improve your overall health and gain many benefits in mind, body, and soul. I challenge people to be the spark to promote positive changes in others and pass the blessing of improved health. It&apos;s never too late to discover yourself, reach for the stars, expect great results, and aim high! "There will be challenges but you can overcome them. It&apos;s never too late to get started." The two areas that challenged me most were the diet and weight training. My coach created a nutritional plan for me that eliminated processed foods, which requires meal prep. The second challenge is decreasing the cardio and increasing my weight training. Since I participated in lots of cardio classes prior, I had to get accustomed to more strength training. My future plans include competing on the national level in figure and obtaining my IFBB pro card. During the offseason, I will focus on leaning out more, especially on the lower body. I&apos;m also studying to become a personal trainer and help others achieve their goals. Anyone can do this. It just takes a change in mindset and focus so nobody takes you off your game plan. There will be challenges but you can overcome them. It&apos;s never too late to get started. Bodybuilding.com is one of my favorite sites. The articles are very informative. The transformation stories are inspiring and function as fuel to push me harder to become the best me. I also love the supplements that are available.